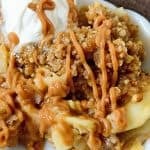 The best way to serve this Slow Cooker Apple Pear Crisp? Warm over vanilla ice cream and topped with caramel sauce. SO good! Everyone will be wanting more! In a large bowl, stir the flour, oats, brown sugar, 1/4 cup white sugar, nutmeg, cinnamon, and nuts together until combined. Add the butter and mix with a pastry blender, fork or hands until pea-sized lumps are formed. Place the apple and pear slices in the base of the slow cooker and add the apple juice. Stir in cornstarch and apple juice. Sprinkle flour/topping mixture evenly over fruit. Serve warm with a scoop (or 2) of vanilla ice cream and a drizzle of caramel sauce. If you don’t have apple juice, substitute 1 tbsp lemon juice, and the rest water.